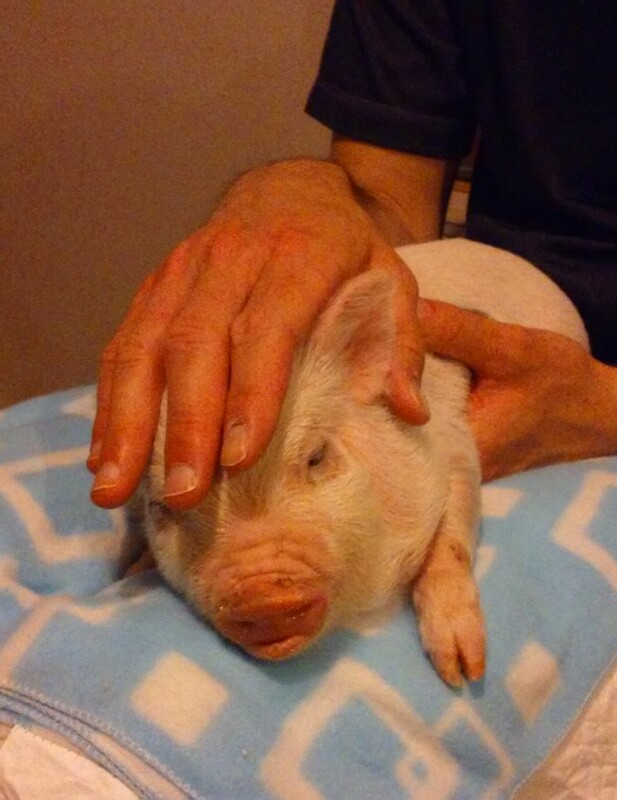 We knew we wanted a pet mini pig for a long time before we were ready. My husband and I agreed that we would wait until we had a house in the country where the pig would have plenty of space and we wouldn’t have to stress about the pig’s size or location restrictions. For several years while we searched for the right house, I researched mini pigs: types, breeders, care requirements, and what it takes to raise them. The time finally came and, once we were settled in our country house, I kept my eye out for available mini pigs at the breeder I had selected. An available piglet soon popped up on the breeder’s website, and I fell in love. The timing was quicker than we planned, but my husband and I both decided this mini pig was the one. We contacted the breeder, asked some questions, and had a deposit on the little piglet before we knew it. The breeder told us the piglet was almost ready to go home, so we had a week to get everything ready. Ah! That week was crazy with excitement, nervousness, and trying to make sure everything was set up perfectly for our new pet. Now that it was all real, I was incredibly nervous. Would I like having a pig in our home? Am I ready to care for a piglet? Will the dogs get along with the pig? Wait, do dogs eat pigs? What if it doesn’t work out? Will I fail as a pig parent? The day finally arrived to pick up our piglet. I had everything prepared, including the play pen, litter box, crate, food purchased, etc. We got in the car and met the breeders about an hour away from our home. When we arrived at the meeting place, the breeders stepped out of the car and there was our little piglet. He was adorable and also so strange! I immediately wondered what in the world I was doing buying a piglet, but I remembered this was all just new and that I did my research and was as ready as I could be. I was calm again. Then the breeder handed the piglet to me for the first time, and the squealing began. How can such a small animal make such a loud noise? So much for being calm! 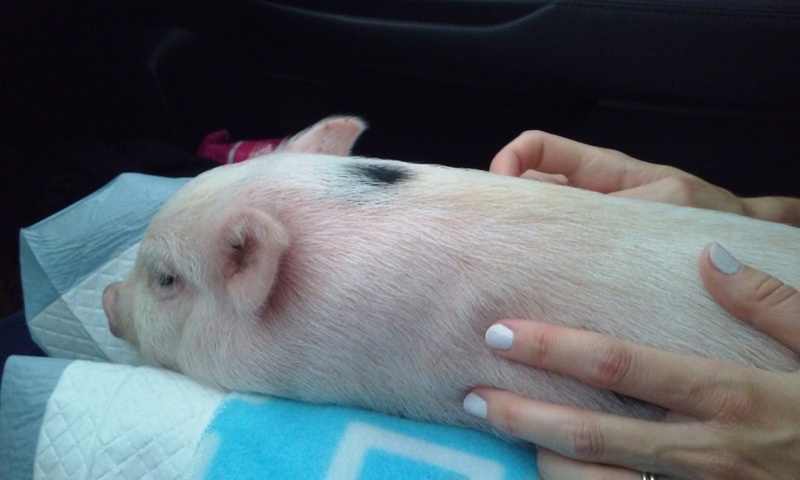 We got the piglet into the car and settled in for our ride back home. I was prepared to have him ride in the crate on the way back, but he arranged himself in my lap and stayed there the whole way. Oscar on his first ride home. Okay, I was feeling better about my decision again. We decided to name him Oscar, and I was determined to raise him into a happy, well-adjusted member of the family. Once we made it home, we decided to put his harness on and take him outside in case he needed to go before we took him into the house. We were surprised at how easy it was to get the harness on him and were feeling pretty good about pig parenting when we set him down in the garage and little Oscar slipped out of his harness and was on the loose! In case you’ve never had a “naked” piglet running around squealing in your garage, let me just tell you that it really makes you wonder what you’ve done with your life. A few weeks earlier, I was living in the city with two relatively trained dogs and now I was in the middle of the country chasing a squealing pig around. My husband and I managed to work together to get the garage door closed (which required a lot of “you go that way, now this way, he ran to the left, he’s under the car now, now he’s behind that box by the mower”) which was a relief. After another hour and a swift, firm grab by me, the chase ended with a tired pig and relieved parents. That’s when I knew this was going to be an interesting journey.